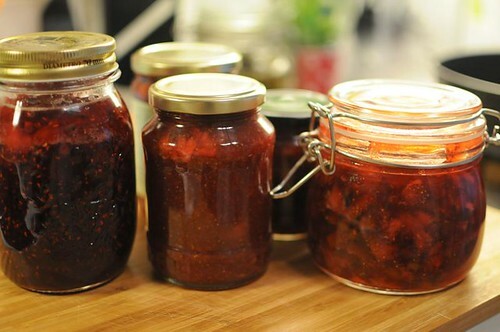 Strawberry season is coming to an end, and if you want to preserve any, this is the time. I'm no master jam-maker, but with pectin-filled jam sugar, even I can succeed. This time, I made three different varieties, all very simple. Play around with them as you wish, the proportions are not that important. I find jam sugar very forgiving. The basic idea is the same amount of sugar as you have berries, but you can use quite a bit less if you prefer. I worked with what I had at home, which is why some of the amounts might be a bit random. I don't trust my canning capabilities (really, I'm not careful enough) so I make small batches and keep them in the fridge. Mix rhubarb, berries, lime zest, juice and sugar. Let sit for one hour. Heat in a large saucepan, until boiling. Cook on medium heat for five minutes, then immediately pour into clean jars and seal. Score and scrape out the vanilla seeds, and mix with the berries and the lemon zest and peel. Add the sugar and mix well. Let sit for one hour. Mix everything in a large bowl. Heat in a large saucepan, until boiling. Cook on medium heat for five minutes, then immediately pour into clean jars and seal. Let sit for one hour. Will try the strawberry,lemon vanilla one...sounds delicious! I already forgot how to do this I'm glad I have found your site. I am making these again.